I recently returned from a trip to San Francisco. And San Francisco is home to City Lights. City Lights was founded in 1953 by poet Lawrence Ferlinghetti and Peter D. Martin. It remains one of the few truly great independent bookstores in the United States. City Lights was the first to publish the Beat poets (Jack Kerouac coined the term "Beat Generation," describing the down-and-out status of himself and his peers during the post-war years). The term Beatnik as in Beat Generation, is a loose synonym of Hippie. And I am a Hippie Mom. And this Hippie Mom is also a poet. He gave the young woman a kiss. He gave the old woman a puppy. Good news is I don't write much poetry anymore. You can probably see why. Not only am I published, I've made money writing poetry. Years ago I won the poetry slam at The Original Sub Shop and shared a cash prize of $7 dollars and some change. A friend and I were sitting at a table when the slam was announced. For fun we decided to enter. My friend, let's call her Carolyn, wrote about hommus, and I wrote about abortion. We combined the two poems into one and my friend read it in that exaggerated, annoying drawn out voice that all the poets use. Yes, hommus and abortion--sure winners every time. And that friend, Carolyn, was with me in San Francisco. Where we saw City Lights. And City Lights has published many of the books of Charles Bukowski. But wait. Aren't you supposed to be writing the raw and often ridiculous details of the trips to San Francisco that have marked life-changing events, you say. Yes, I am. But I can't let April go by without a tribute to National Poetry Month. Just not possible for this Hippie Mom. What a coincidence. I'm a poet as well. 2B or not 2B? What about 2A and 2C and all the other letters? They may feel left out. Yep. That's why I'm not a poet. I'll have to check out that bookstore next time I'm there. This was a very poetic and playful entry, Hippie Mom! Good one from Chuck - excellent. Independent bookshops are superb, no question. I often have trouble liking poetry (I am the World's Worst English Teacher that way), but Bukowski ROCKS ("It's better to be driven around in a red Porsche than to own one"). So do your poems. You are totally my kind of poet. Here's the level of my personal poetry: when you started out by noting that SF is the home of City Lights, I immediately thought this post was going to be about Journey and "when the lights, go down, in the city." I hear no mention of a bra burning in that poem although now that I think about it it is more than likely Mr. Bukowski didn't have a rack. 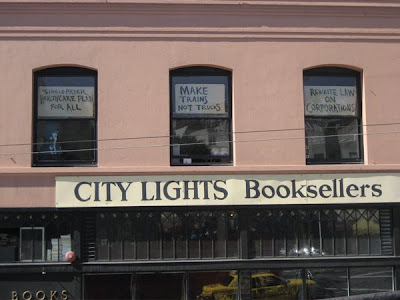 When Carrie and I went to SF quite some while ago, it was the biggest thrill for me to see the City Lights bookstore. It was a rush for me.